2-Sarah Ann Walker was born on 13 Jan 1852 in Glenore, near Hagley, died on 29 Aug 1926 in Pine Road, near Penguin at age 74, and was buried in Aug 1926 in Penguin. Sarah married Henry Dobson, son of William Dobson and Anne Richardson, on 29 Jun 1871 in Walker Family Home At Exton. Henry was born on 4 Jul 1841 in Snaith, Yorkshire, England, died on 13 Jul 1920 in Penguin at age 79, and was buried in Aug 1920 in Penguin. The founder of the pioneer Dobson family, William, was the son of Mr. and Mrs. George Dobson (1787-1860). He was born at the ancestral home Pollington Hall, Pollington, Yorkshire in 1818. He married Anne Richardson who was also born in 1818. Their first child Henry was born at Snaith in Yorkshire on 4th July, 1841. With their first born, the young couple sailed from England aboard the Elizabeth Ann on the 9th February, 1842 for a new life in Van Diemen's Land. The family first settled at Caveside then in the 1860's they moved to Glenore where they engaged in farming. Raising cattle was their main interest, especially the Devon breed, although other breeds were also kept on the farm. 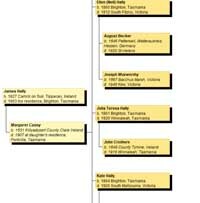 Five sons and two daughters were born to them in Tasmania. George 1850-1922 married Charlotte Kingston, William married Rosetta French, Frank or Frances married Alice Stretton, Arthur married Ellen Badcock, Albert married Lillis Cope, Margaret married Andrew Hingston, Mary Anna 1848-1917 married Charles Best Heazlewood 1849-1917. William and Anne were both very active members of the Methodist Church where they served as Sunday School teachers and as local preachers. All their children were educated at the Glenore school. Both William and Ann are buried in the Hagley Methodist Cemetery. William died in 1885 aged 67 and Ann 10 years later in 1895 aged 77 years. 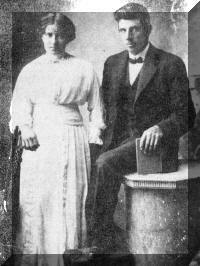 At the age of 30, Henry married 19 year old Sarah Ann Walker, the 10th child born to Michael and Sarah Walker. They were married on 29th June, 1871, the same day as Sarah's sister, Mary Ann Walker married Isaac Simeon Richardson. The ceremony took place at the Walker home in Exton, the marriages being conducted by the Wesleyan minister the Rev. Andrew Ingles. That Mary Ann and Isaac were married first, is verified in the Dobson Family Bible, as the marriage certificate of Henry and Sarah was witnessed by Mary Ann and Isaac Richardson. 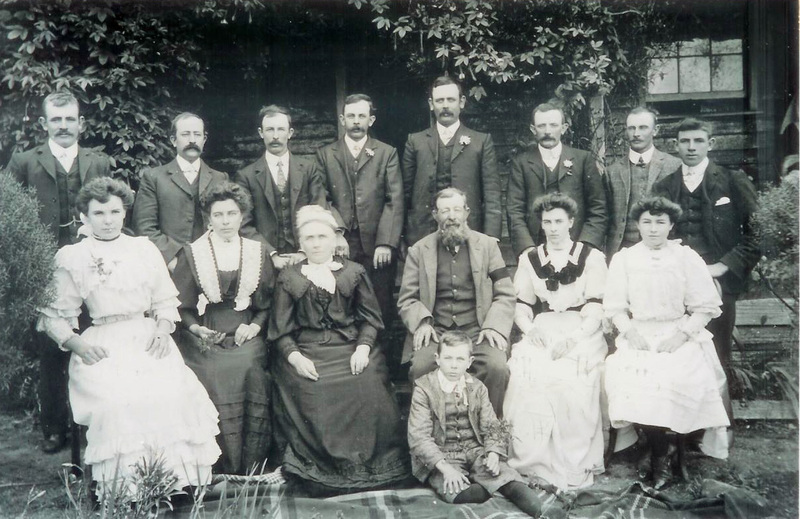 After their marriage Sarah and Henry lived at Exton, where 10 of their 15 children were born — George Edward 1872; Samuel Hildreth 1873; Alexander John 1875; Walter Thomas 1876; William Michael Henry 1878; Lillias May 1879; Stephen Peter 1881; Ethel Ann born 1883 died 14th August, 1844 from whooping cough as did Mabel Ann born November 1884, died 29th December 1884; Louis Robert 1885. Henry was a farmer and cattle dealer, and travelled extensively around the surrounding districts. The family moved from Exton in 1886 to live for several years in a two storey stone house at Rubicon which he leased from A. F. Rook. At about the same time Henry also leased The Avenue almost opposite the Rubicon property. Today the Rubicon farm of 484 acres is owned by Maureen and Michael Bennett, while The Avenue is owned by Thomas Archer and Sons who succeeded Thomas Kentish Archer who bought the property in 1901 from Mr. Rook. This would coincide with the time that Henry and Sarah moved to Whitefoord Hills. The original barns are on both properties as well as a stone forge and chimney at Rubicon. The old stone house is no longer there, but a large Cyprus tree still proudly stands in front of the original home site which was built in 1846, A new brick homestead was built by the Bennett's near where the original homestead stood. Two more children were born to Henry and Sarah whilst at Rubicon, Ada Mary 1888; and Henry Arthur 1889. The Launceston Gazette of 1886 reveals that H. Dobson of Exton leased 50 acres of land at Mole Creek to William Applebee of Chudleigh for £15 per year. At the time of the move to Whitefoord Hills which adjoined the Rubicon and The Avenue properties, Tasmania's economy was in a very depressed state. Banks were failing, and people were becoming bankrupt and could not pay their debts. Henry was owed a large amount of money through his cattle dealing. During their sojourn at Whitefoord Hills two baby girls were born, Leila Florence 1891; and Myrtle Sarah in 1893. Rather than go bankrupt Henry sold up and in January 1894 when Myrtle Sarah was three months old, the family moved to Pineroad, Penguin where Henry obtained a large area of land from his old friend Wilhem von Bibra, who, at this time, lived at Dunorlan. The land stretched from Pineroad west to West Pine. It was here that the youngest child Basil Albert was born on 19th November, 1895. Some of the older boys came to the property first living in a hut, while the homestead was built. As well as raising cattle, they engaged in farming and dairying, cattle droving and butchering. The farm cream was left to set in the large flat milk dishes which were common features of a pioneer's dairy. Later, a creamery was built on the Dobson property at Pineroad where neighbours brought their milk to be separated and then some of the cream was churned into butter. When a butter factory was built at Riana, the creamery was closed. A cottage was built for the creamery manager, a Mr. Morey. This cottage was kept in good order and occupied until 1922 or 1923 when it was burnt down while the occupier was away from home. Granddaughter Linda Dobson recalls seeing a lid belonging to one of the churns about 18 months ago when she visited Harry Smith (grandson of Henry and Sarah) in Leven Bank Rest Home. It was being used as the base for a horse and carriage made with shells by Harry's wife. In the early days at Pineroad, Henry often travelled to Forth, or as far as the Don River (original River Don Trading Company) for provisions, at daybreak a team of 10 bullocks would be yoked, to draw a load of potatoes for sale. On the return journey they would bring back a ton of flour and other supplies to last for some time. An overnight stop was made at Forth, and the weary travellers would arrive home in the dark next day. Henry was always accompanied by one of his sons. As each of the older boys married, they were built a cottage on the property, and these were scattered in between the Pineroad and West Pine roads. Alexander (Ben) lived nearer the West Pine road with his family attending school at the Blythe. The various families farmed their holdings for many years, before moving on to other districts. A highlight of each year was the large picnic held on the Dobson property on Boxing Day. Neighbours from near and far, friends, and their families all came, several hundred in all, bringing baskets of food. One daughter, .Myrtle (Hall), remembered the cooking, which went on for days beforehand, resulting in dress baskets full of sausage rolls, pies, cakes and so on; while the elder daughter Lillias (Smith) had vivid memories of a great boiler of milk being made into blancmange, then left to set in the large flat milk dishes, along with gallons of jellies set in like manner. Cricket matches, horse racing, and much cheerful exchange of family news, were the order of the day. On Sarah's birthday, 13th January, the McHugh family who lived on the West Pine Road adjoining the Dobson property, held a similar celebration day. Sarah was loved and revered by all her family and grandchildren. From her earlier days at Rubicon she suffered with dropsy, finding it hard in later life to move around. She was nimble fingered, engaging in embroidery and crochet (a gift she passed on to her daughters). She had a life-long love of her pot plants. Her granddaughter Thea Plapp (Hall) remembers Sarah in her long black dress, with long white muslin or calico petticoats with tucks and lace. In winter a flannel petticoat was worn. Sarah's "best" black frocks were beautifully braided. A white silk bow was tied around her neck at all times, and a little close fitting cap also adorned her head. These were beautiful little confections of gathered lace, stitched on to a buckram shape, and adorned with tiny little ribbon bows, here and there amongst the white lace. The ribbon bows were either mauve or black. The whole piece had to be dismantled from time to time for washing, then re­assembled. She possessed several of these little caps. William Michael Henry enlisted in the Tasmanian Imperial Bushmen's Contingent on 31st January, 1901 and served with this unit during the Boer War in South Africa. He was awarded the South African War Medal and was discharged on 16th June, 1902. Alexander (Ben) also enlisted and was accepted for active service in the Boer War but contracted a rheumatic ailment and was invalided from the Armed Forces. They were followed in 1914 by Stephen Peter who enlisted for active service in the Great War of 1914-18. He served as a driver in the 1st Division Ammunition Column after which he returned to the family. Henry and Sarah were renowned for the hospitality they so generously extended to travellers on Pineroad. They were active members of the Pineroad Methodist Church. In 1916 the original home and remaining property was sold to a Mr. Crawford, who in turn sold it to the Repatriation Department, for soldier settlement after the War. Henry and Sarah moved to Penguin into a home owned by their son Walter, after the marriage of their youngest daughter Myrtle to Charles Hall of Pineroad. Henry died there on 13th August, 1920. Sarah then went to live with her son Hildreth and his wife Emma, at Pineroad, until her death on 29th August, 1926. After Henry's death she loved to spend time visiting other member of the family and their children. At the age of four, her great grandson Neil remembered Sarah wearing her little white caps and the sad day she died at Hildreth and Emma's farm.